The Lemon Bay Touchdown Club was formed in 2012. The group consists of a combination of player's parents and citizens of the Englewood community. The purpose of the Lemon Bay Touchdown Booster Club is to help provide financial support to our Lemon Bay Manta Rays Football team. This website was designed to help us reach our goals. Please utilize it for information and fun, and most importantly recognize those individuals and businesses that helped us reach our goals located in the sponsor page. To help provide new equipment for our Varsity and JV football teams. To provide financial assistance for training camps, workout equipment, and transportation. Educating the public of the need to help and participate. Provide an interaction with sponsors showing them they are part of the team. Recognizing the individuals and businesses that help us reach our goal. 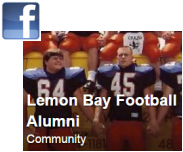 JOIN THE LBHS FOOTBALL ALUMNI FACEBOOK PAGE!